[Leslie Hotson and Norman Holmes Pearson on a George Washington letter.] Autograph Letter Signed from Hotson, and Typed Letter Signed from Pearson, both to Robert Beloe, discussing the proposed sale of his George Washington letter. Hotson's letter from Northford, Connecticut (but sent from a museum in Pieter Cornelisz Hooftstraat, Amsterdam), 29 January 1955. Pearson's letter from 233 Hall of Graduate Studies, Yale University, New Haven, Connecticut, 1 February 1955. Two Air Mail letters, both in fair condition, lightly aged and worn. Both letters are addressed to Beloe (author of the 1960 Beloe Report - education at The Hill House, Queen's Road, Richmond, Surrey. The subject of the two letters is a letter from George Washington to Lieutenant Governor Dinwiddie, Belvoir, 7 March 1754, beginning ''Honble. Sir | If the Vessel you Honour hir'd of Colo. Eyre has not left York'. The letter is now at Mount Vernon. 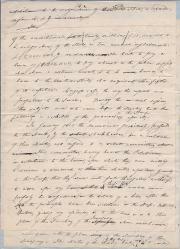 ONE: Hotson's letter, signed 'Leslie Hotson'. 29 January 1955. 1p., 12mo. [ Washington Gledden, religious editor of the New York Independent and opponent of racial segregation. ] Autograph Signature. Place not stated. 29 January 1914. On one side of a 12mo piece of paper. In good condition, lightly aged, folded once horizontally with traces of glue from mount on blank reverse. Firm signature, underlined. Reads: 'Washington Gledden | Jan 29, 1914'. S. C. Pinney, American authority on George Washington Genealogy. Large archive of material relating to the English branch of the Washington family, assembled by American authority S. C. Pinney, comprising manuscripts, typescripts, printed extracts and offprints, photographic and other illustration, and a small batch of letters to Pinney from the English Washington expert Thomas Pape. The collection in good condition, with no more than a handful of items aged or worn. Containing a mass of obscure and difficult to obtain material, from English and American sources, mostly dating from the first two decades of the twentieth century.A. Manuscript material: ONE. [ Joseph Quincey Adams junior, Shakespeare scholar. ] Typed Letter Signed ('Joseph Q Adams'), thanking Henry Guppy, Librarian of the John Rylands Library, Manchester, on behalf of the trustees of the Folger Shakespeare Library, for various favours. On letterhead of the Folger Shakespeare Library, Washington. 12 October 1943. 1p., 4to. In fair condition, lightly aged and worn, with small coffee stain in margin at head. He begins by thanking Guppy for the 'gift of the numerous "Transactions," including the beautiful volume "The English Bible in the John Rylands Library"': 'To our bibliographers as well as to our readers these works will be of the utmost value.' He writes that the war 'has put a temporary stop to our publishing', but that 'we have ambitious plans for the future, and every volume we issue will go promptly to you'. He also thanks him for 'printing my little article on the Shakespeare Signature'. [ J. T. Maleville, nineteenth-century printer in Washington, DC. ] Menu printed on pink silk. 'J. T. MALEVILLE, PRINT, 407 10TH ST.' [ Washington, DC] Undated [1880s?]. Printed in black ink on one side of a 23.5 x 17.5 cm piece of pink silk. An interesting piece of American nineteenth-century printing, with only the printer's details giving a clue to the occasion of the dinner. Within a decorative border, and with Maleville's slug in bottom left-hand corner. A sumptuous 'service à la russe', with potages, hors d'oeuvre, poisson, relevé, entrées roti, entremets and dessert. [ B. F. Stevens of Vermont, London bookseller. ] Stevens' Historical Collections. Catalogue of the First Portion of the Extensive & Varied Collections of Rare Books and Manuscripts relating chiefly to the History and Literature of America [...]'. vi + 229 + pp., 8vo. Frontispiece facsimile letter from Benjamin Franklin. In original printed wraps. In blue cloth binding with title in gilt on front cover and spine. In good condition, on lightly-aged paper, in worn binding. Full title: 'Stevens' Historical Collections. [Richard Rathbun, Assistant Secretary, the Smithsonian Institution.] Typed Letter Signed ('R. Rathbun') to Charles Anthony, Junior, in Argentina, regarding 'the sending of packages [...] through the International Exchange Service'. On letterhead of the Smithsonian Institution, Washington, U.S.A. 28 September 1909. 2pp., 4to. 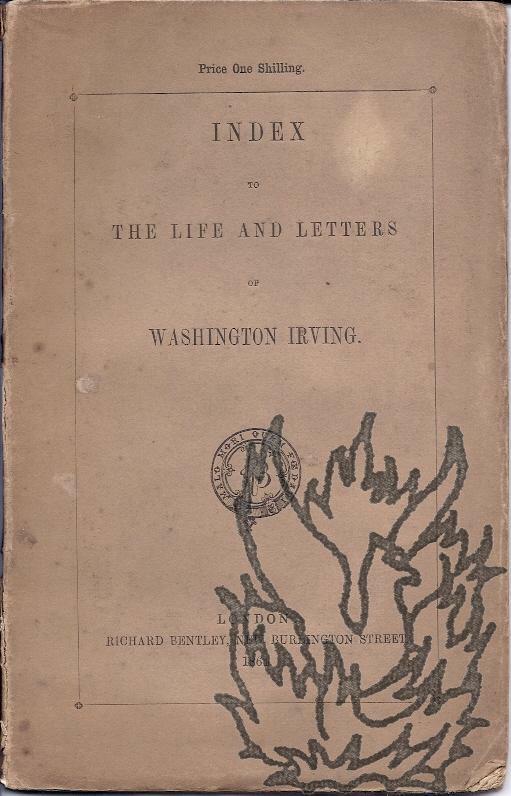 In fair condition, on aged paper, with minor staining from paper clip at head of first leaf. Anthony's letter to Dr L. O. Howard, Secretary of the American Association for the Advancement of Science, 'has been referred to the Smithsonian Institution for reply concerning the sending of packages to you through the International Exchange Service'. He sets out the state of affairs regarding the sending of 'three packages, contents unknown' to Anthony at the Town Hall, East London, Cape Colony. The final paragraph concerns publications sent to Anthony in Argentina. Joseph C. Gordon, Professor of Mathematics, etc., in the National College for the Deaf, Washington, D.C.
Washington: Gibson Bros., Printers and Bookbinders. 1886. 45pp., 12mo. Very good, on lightly-aged paper. In grey printed wraps with statement by E. A. Fay of the National Deaf-Mute College on back cover. Disbound, with stamp and label of the Educational Library, Science & Art Department, London. Introductory note by F. L. Radcliffe, dedication to Francis Green (1742-1809), and preface by Gordon (all three full-page), followed by text on pp.5-17, and supplement on pp.19-45, including index on pp.43-45, and illustrations on pp.34 (in text), 36 ('Dr. Bell's "Dalgarno," or Touch, Alphabet') and 39-41 ('The one-hand Alphabet in general use. [Printed item.] London County Council. Report by G. Topham Forrest, F.R.I.B.A., F.R.S.E., F.G.S., The Architect to the Council, on The Construction and Control of Buildings and the Development of Urban Areas in the United States of America. 109pp., 4to. With frontispiece ('LCC: Ossulston Street Area, Saint Pancras') and 35 plates ('Drawings'), including five fold-outs, two of which are coloured maps of parts of London (one begin 'Suggestion for Re-development of part of Chelsea'). Also included are two maps of the Brady Street Area of Bethnal Green. In fair condition, on aged paper, in worn and aged wraps. Stamps and label of the Board of Education Reference Library. Autograph Letter Signed ('E. O'Connor'), in Spanish, from the Argentinian Admiral Eduardo O'Connor to Coronel Ricardo Mombello, with reference to 'el Conscripto Carlos Wasington [sic] Anthony'. On letterhead of the Gefe del Arsenal de Puerto Militar. 26 February 1914. 2pp., 8vo. On bifolium. O'Connor's signature damaged by wear along a vertical fold, otherwise in good condition, on lightly-aged paper. Scan on request. Pencil sketch of George Washington's home Mount Vernon by 'G E Blenkins', with leaf from the orange tree planted by Washington, and explanatory Autograph Note by Blenkins. 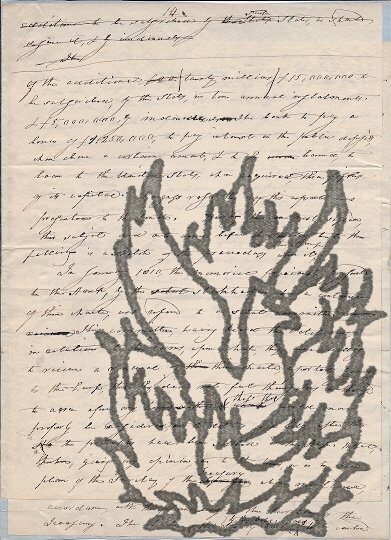 Sketch made and leaf taken by Blenkins on a visit to Mount Vernon, Virginia, in 1840. While only a rough pencil sketch, the drawing is an attractive one, landscape on a piece of wove paper, 20 x 25 cm, with 'JESSUPS' watermark. In good condition, on lightly-aged and creased paper, folded into a packet for postage, with remains of red wafer. Beneath the drawing, in ink in a shaky contemporary hand: 'Lawn view from the backs of Mount Vernon | This is from the Orange Tree planted by himself.' The reverse carries the following note: 'I made the enclosed rough sketch of Mount Vernon the residence of Genl. [Two illustrated plywood trade catalogues.] [First:] Wilh. Schauman's Plywood Factory Ltd. 1912-1932. [Second:] "So we built our home of HARBORD PLYWOOD". Schauman catalogue: Jyväskylä, Finland. 1932. Harbord catalogue: Harbor Plywood Corporation, Chicago, Illinois, and Hoquiam, Washington. 1930. Schauman catalogue: 59pp, 4to, consisting of 9pp. of letterpress and 50pp. of collotype illustrations. In original cream printed wraps, with cover printed in red. In good condition. Written entirely in English with informative captions. Harbord catalogue: 16pp., 12mo. In original wraps printed in yellow and black. Stapled pamphlet on art paper. In good condition, with staples beginning to rust. With numerous illustrations of 'the spacious new home of E. W. Daniels, Vice-President of the Harbor Plywood Corporation and manager of its Door units'. Autograph Letter Signed ('D Green') from Duff Green, editor of the 'United States Telegraph', to the Hon. David Henshaw of Boston. Typed Letter Signed ('James Bryce') from the historian and Liberal politician James Bryce, Viscount Bryce, to E. Byrne Hackett of Yale University Press, discussing the American Booksellers Association banquet. The British Embassy, Washington; 14 April 1911. 1p., 4to. Good, on lightly-aged paper. Bryce writes that he has not forgotten Hackett's 'invitation to the American Booksellers Association's banquet' in New York, but that it is unlikely that he will be able to attend 'seems to be extremely small, so that I must ask you not to announce me as being present. London: Richard Bentley, New Burlington Street, 1864. Separately published from four volume edition (1862-4), pp.308-347, 8vo, printed paper wraps, darkened, wear at spine and corners, minor foxing, mainly good. Bentley (Turner) Index 1110, ascribed to J. Munnings. 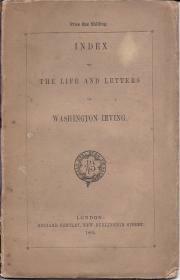 A bookseller on viaLibri reveals that an index is anticipated in the fourth volume of the Life and Letters published by Bentley, 1862-4. No mention is made of this Index in either COPAC or WorldCat's listings of copies of the Life and Letters. Very scarce. 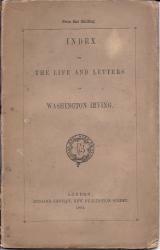 [Printed offprint pamphlet relating to the American President George Washington.] 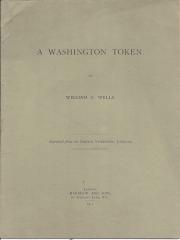 A Washington Token. By William C. Wells. Reprinted from the British Numismatic Journal. London: Harrison and Sons, St Martin's Lane, W.C. 1915. 4to, 7 pp. In original printed wraps. Fair, with an unobtrusive closed tear to the title leaf. The purpose of the article is to explain the relationship between John Washington, the issuer of the token the article describes, and the first American president. 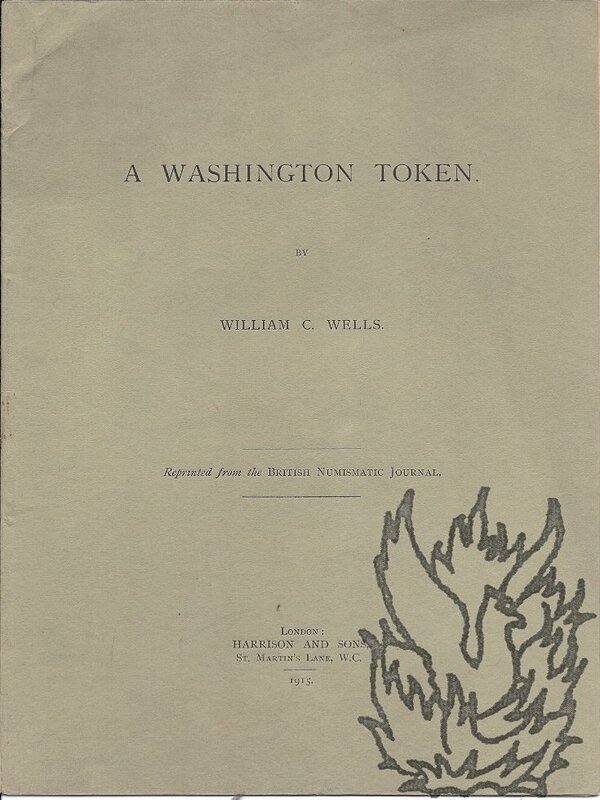 Both sides of the token are illustrated on the front page. The last page carries a family tree of 'The Washingtons of Northamptonshire, Sussex and Virginia'. The only copy of this offcut on COPAC is at the British Library.